Ka‘ahumanu was born about the year 1768, near Hāna, Maui. Her siblings include Governor John Adams Kuakini of Hawaiʻi Island, Queen Kalākua Kaheiheimālie (another wife of Kamehameha I) and Governor George Cox Keʻeaumoku II of Maui. Generally ambivalent through 1824, it is generally accepted that Kamehameha’s widowed Queen, from 1825 until her death in 1832, was one of the staunchest friends of the missionaries and one of the foremost supporters of their cause. The following day, the missionaries were told they may settle in the islands for a probationary period of 1-year. 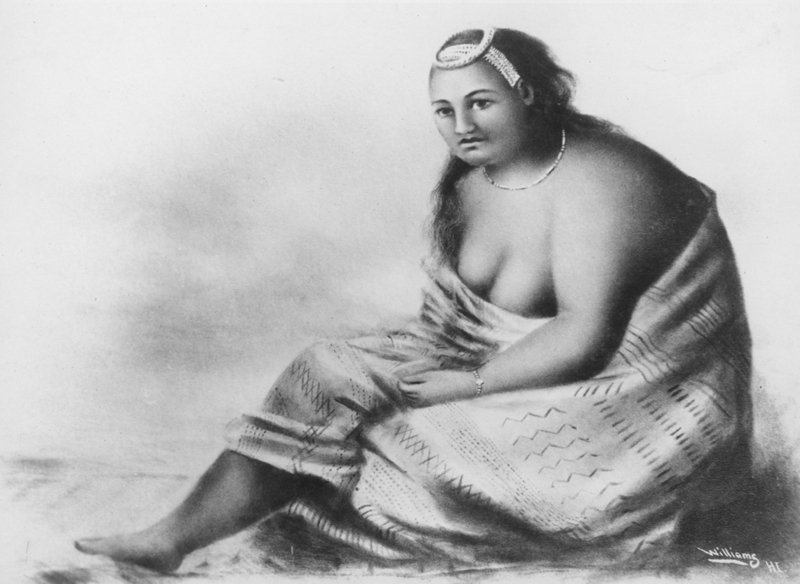 Soon after the first anniversary of their landing at Honolulu on April 19, 1821, Kaʻahumanu, Kalanimōku and Kalākua visited the mission and gave them supplies; this visit became important because during it Kaʻahumanu made her first request for prayer and showed her first interest in the teachings of the missionaries. From that point on, Kaʻahumanu comes into more constant contact with the mission. She was described to have a kindly and generous disposition and usually had as pleasant relations with foreigners who respected her royal rights. She was cautious and slow in deciding – more business-like in here decision-making – but once her mind was made up, she never wavered. In 1822, she had a change of attitude toward education. Her brother, Keʻeaumoku (Governor Cox,) proposed that they should together follow the missionaries, encourage schools and allow all their people to be taught. Hesitant, at first, she later went along, and on August 6, 1822, she started to learn to read. She had requested baptism for Keōpūolani and Keʻeaumoku when they were dying, but she waited until April, 1824, before requesting the same for herself. On December 5, 1825, Kaʻahumanu, six other chiefs, and one commoner were baptized and received holy communion. The widowed queen took the Christian name of Elizabeth, which she added to her official signature. In December, 1827, laws against murder, stealing and adultery were adopted by the chiefs and proclaimed by Kaʻahumanu, who addressed the people, “demanding their attention to the laws of the land … and to others which were to be taught and explained more fully to the people, before their establishment.” The ceremonies, planned by Kaʻahumanu, included hymns and prayers. “Most of the missionaries visited her in those trying hours.” Her thoughts were continually on the future of her islands, and she was delighted a short time before her death when the first copy of the New Testament was hurried through the press, bound with her name embossed on the cover, and brought to her. She was buried at Pohukaina at ʻIolani Place and later transferred to Mauna ‘Ala, the Royal Mausoleum in Nuʻuanu Valley. The inspiration and information in this summary is from a three-part series in The Friend titled, ‘Kaahumanu – a Study’ in 1925 by Gwenfread E Allen. It focused on Kaʻahumanu’s interests and activities related to the American Protestant missionaries who first came to Hawaiʻi in 1820. The image shows Kaʻahumanu. I have added other images to a folder of like name in the Photos section on my Facebook and Google+ pages.